Building out new lists really isn’t all that different from creating new pieces of web content. Just as you can create new Web Content Structures to control the input of a particular type of web content, you can use Data List Definitions to control the input of new list types. Similarly, just as you create a new piece of web content, selecting the Structure you would like to use with it, list.it users (we’ll call them Listies) choose the Definition they want to use when creating a new list. Now that a data definition is in place, all that remains is to create a new data list to capture the information we’re going after. This is the easiest step in creating the list, with only a few clicks between a data definition and robust data entry and delivery. From the Content section of the Control Panel, select Dynamic Data Lists. Click on Add to create a new list based on a data definition, which in our case is the volunteer sign-up. 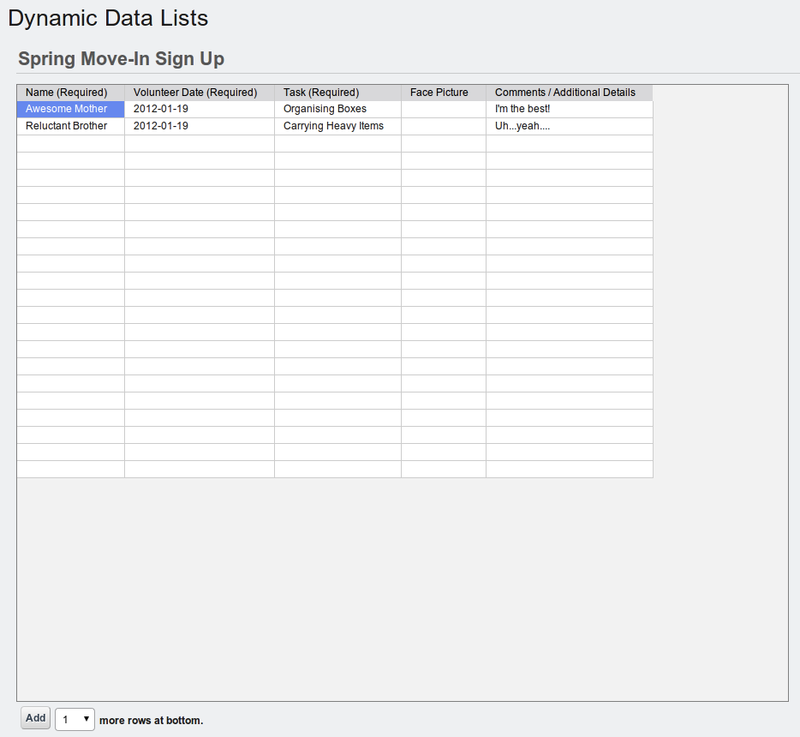 Give the data list a name, like Spring Move-In and a description to assist administrative users in the future. Last and most importantly, click Select under the Data Definition section–this is where you set the data model that drives this list. Choose the Volunteer Sign-Up data definition you created, then click Save. Now that you’ve created your brand new volunteer list, you can pester everyone you know to sign up. But what would it look like for them to add an entry to this list? The data definition you’ve previously created (or selected) defines the layout as well, which means the form looks just the way you laid it out. Figure 9.4: Entering a new data record. But how will this data appear? How will my awesome, new Volunteer Sign-Up sheet or that boring Jobs Listing look? The answers to these pressing, burning questions bring us to the mecca that is the display side of this equation. A nice way to enable people to use your forms is the Dynamic Data List Forms portlet. This portlet is tailored to entering new records. When you deploy that data list for your users to sign up for a retreat, or your family members to volunteer to help you move, using the data list form allows you to simplify the sign-up process and hide the contents of the list. Using the Dynamic Data List Form is exactly the same as using the Web Content Display portlet: just set it up, point it to a list (either existing or new) and let it go. This is very easy to do. To display a list inside the portlet, add the Dynamic Data List Form portlet to a page from the Dockbar: Add → More → Dynamic Data List Form. With the portlet on the page, click on the small gear icon in the lower left corner. This takes you to the configuration page, where you can select a list to use for the form entries. Each time a user visits your page with the volunteer sign-up, they are presented with a form to fill out. If they have already filled out an entry, a message is displayed instead. Unlike the Web Content Display portlet, however, the Dynamic Data List Forms portlet may not be installed already in your portal. If not, just head over to Liferay Marketplace, grab it and install it. You can publish your lists anywhere in your portal too. Read on to find out more about that. Figure 9.5: The default data list display. This isn’t all that exciting, but it allows users to see the list’s contents, and if they have permission, to add and/or edit list items. Within a site like list.it, this type of interaction is used for display-only lists that the user chooses to expose to others, or for the user’s own private lists. But you can improve the display. You can show the data in a spreadsheet, so you can view the responses to your Volunteer Sign-Up in a comfortable, easy-to-read format. The Dynamic Data List Display portlet provides an easy way for a user (such as a member of a site) to interact with whatever list is active and available. Editable: allows users that have permission to add new entries to the list. By default, this is disabled and when enabled, administrators are the only ones with add permission. To easily grant access to other users, edit the permissions on the list you’d like to grant access to, and grant the Add Record permission. Spreadsheet View: displays the list in a dynamic spreadsheet view. This allows users with permission to interact with the list in the same way as in a standard spreadsheet program. Now, as useful as this default display is, and it’s certainly useful for my to do list and my memo notes, it can be an awkward way to ask my volunteers to sign up. In fact, any time I want other Listies to interact with my lists and contribute responses, I really just want a simple form to show them. They don’t need to see the full range of responses. And in some cases, it can be hazardous to your health for everyone to see the responses. Then you don’t have to explain why your sister-in-law won’t work with your brother on the same task because of his B.O. problem. 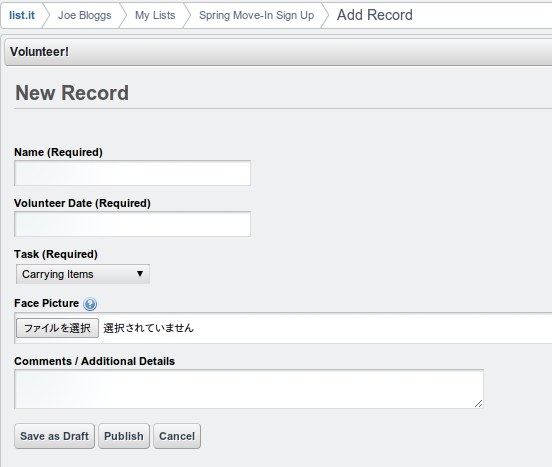 For reasons like that, you’ll need to customize the data entry form or the display of the list. Liferay lets you do exactly that using a custom detail template or list template.